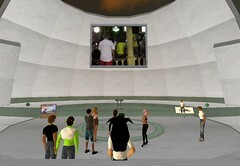 Join us in Second Life! This entry was posted on Friday, June 23rd, 2006 at 2:30 pm	and is filed under Uncategorized. Everywhere i go i see secondlife being mentioned now. Amazing how much this grew since this post almost a year ago. I cannot say how much I love this MMO, gaming it is just pure awesomnes! It is not one game that is better than this game! do you not belive me?! Check it on your own! i used to hangout with my neighbor since he moved in, and then suddenly he disappeared, so i thought he moved away … one year later i saw him taking out trash and find out that he was playing secondlife all the time …. Of course, what a magnificent internet site and educative posts, I absolutely should bookmark your site. Best Regards! Gary Hackett just completed 25 years at MIT Lincoln Laboratory in Lexington, Massachusetts where he manages the College Recruiting Program. Lincoln Laboratory is operated by the Massachusetts Institute of Technology as a research and development center with specific focus on national security.